Popular culture; United States; History. Anyone who has ever wondered where Dorothy's ruby slippers, George Washington's teeth, or the world's largest olive are located will be thrilled to take this journey to find hundreds of the most important items from America's popular culture. Found in such major institutions as the Smithsonian and the Basketball Hall of Fame as well as in such offbeat collections as the Sing Sing Prison Museum and the Delta Blues Museum, these pop culture treasures include the most famousÃ¢ÂÂand quirkiestÃ¢ÂÂitems from movies, crime, TV, sports, music, history, and America's roadside attractions. 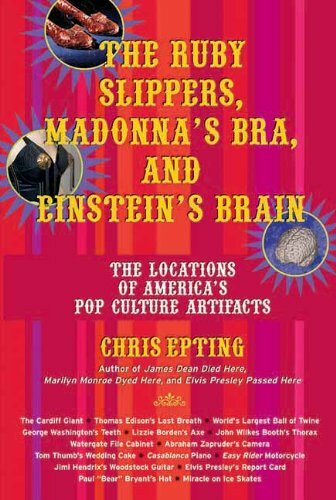 The Ruby Slippers, Madonna's Bra, and Einstein's Brain is divided into the following chapters: American Curiosities, Roadside Relics, Historic Artifacts, Criminal Remains, Celebrity Antiquities, Movie and Television Keepsakes, Music Mementos, and Sports Memorabilia. There's even a list of the Top Ten Missing in Action Pop Culture Artifacts. About: Anyone who has ever wondered where Dorothy's ruby slippers, George Washington's teeth, or the world's largest olive are located will be thrilled to take this journey to find hundreds of the most important items from America's popular culture. from Santa Monica Pr Llc (March 1, 2006); titled "Ruby Slippers, Madonna's Bra, and Einstein's Brain: The Locations of America's Pop Culture Artifacts"